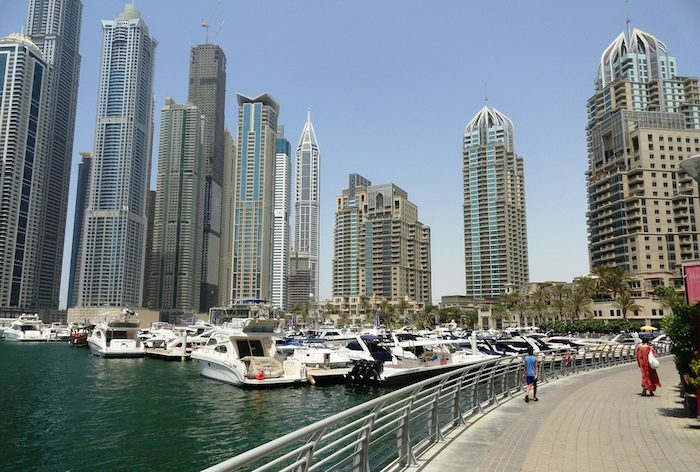 The promenade alongside Dubai’s Marina is perhaps one of the most scenic runs in the city, with towering skyscrapers lining the paved, palm-lined path on one side, and turquoise waters and yachts on the other. Although it can get busy with commuters in the evenings, it’s a near perfect early morning run, In full, the Marina walk is an 8 km (5.3 mile) loop, with paths on each side. There are three roads that cross over the marina, so you can do a shorter loop. Add-On: Follow the Palm Jumeirah out to the point for some stunning views of the city. It’s about 4 km out, but the most pleasant part is the 1.5 km paved path through Palm Jumeirah Park. At the tip of Palm Jumeirah is Crescent Rd. (reachable by car or monorail only), which is a spectacular waterfront road with walking path, 11.5 km from end to end.